Titanium anode ribbon is primarily used for preventive cathodic protection in new buildings or where cover to reinforcement is low, where reinforcement is congested or in cases where due to structural reasons, an increase in weight is not allowed. 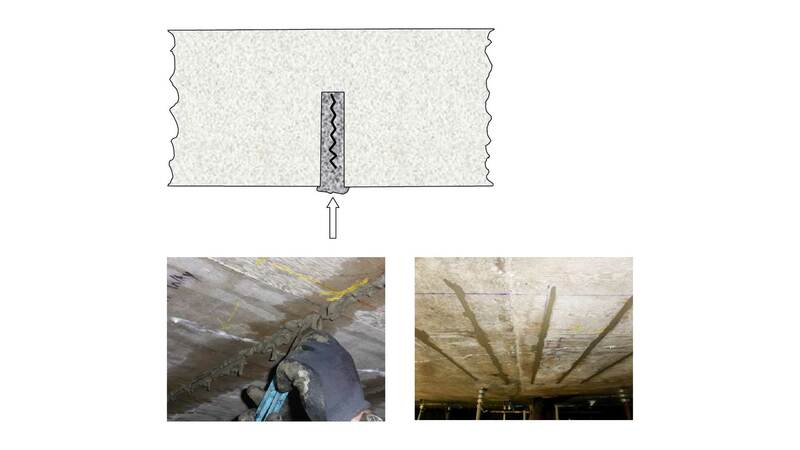 In the case of rehabilitation or repair works the anode ribbons are installed in slots cut into the concrete surface. 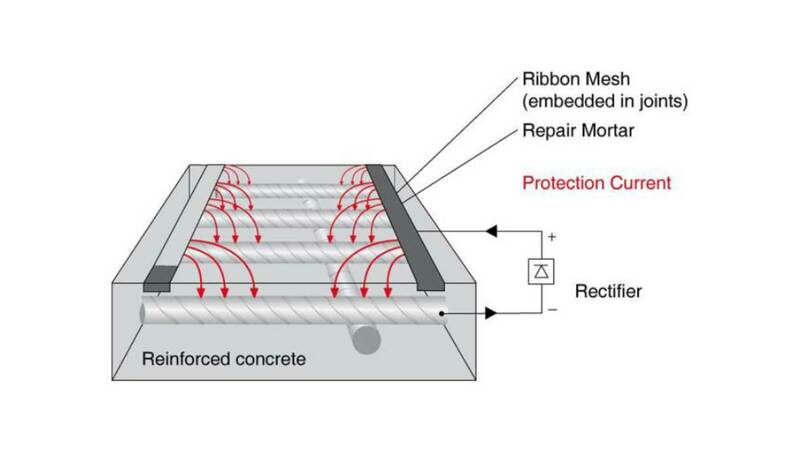 In the case of preventive corrosion protection the anode ribbons are fixed to the reinforcement by keeping a certain distance from it by plastic bar clips. The optimum distance between the neighbouring anode ribbons is determined by the reinforcement density and the desired current distribution. The anode ribbons are usually installed at distances of 20 to 40 cm. The table to the right shows the difference in resistivities between products that have been specially developed to have low resistivity, ie high conductivity for applications such as embedment of anode mesh, encapsulation of anodes or to comply with the requirements of the old Highways Agency Specification BD 27/86 for low resistivity repair mortars. The resistivities in dry conditions will be greater than the figures above. 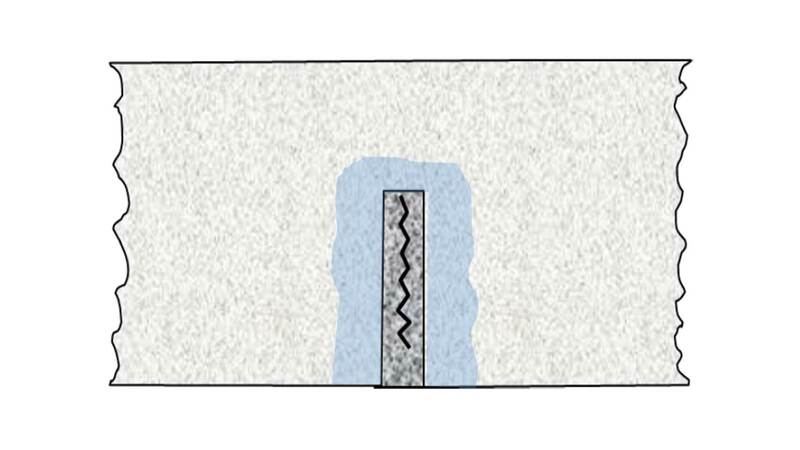 Cut a slot into concrete taking care to avoid reinforcement. 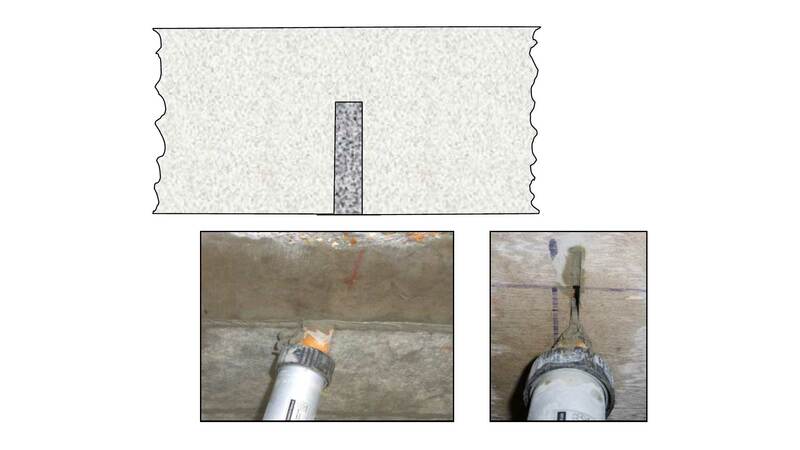 Ensure width is adequate enough to place the embedment mortar. Clean the slot and dampen it with water spray and a fine brush. 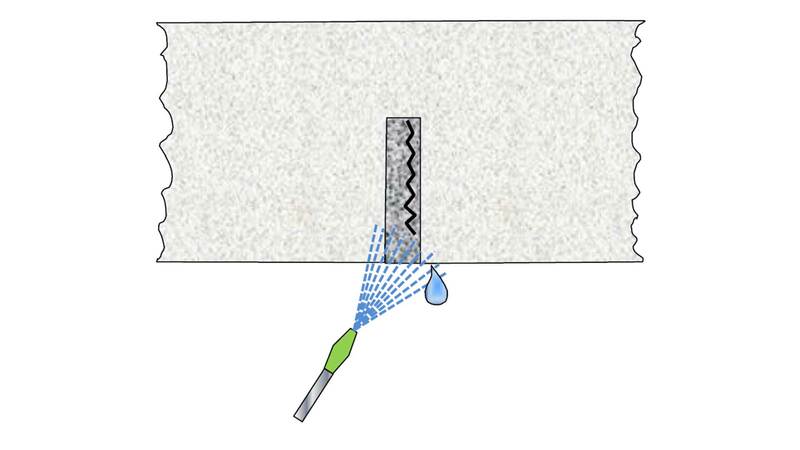 Mix the selected anode embedment mortar with a suitable mixer such as a twin-bladed mixer paddle. This will stop the mixing drum from rotating and will also speed up the mixing process. Alternatively, use a forced action mixer such as a Rotamixer or a Mixal mixer. Place the embedment mortar into the slot. The best way is to use a pneumatic hand pump or a powered pump. Pre-cut the ribbon anode into the required lengths. Press the ribbon anode into the slot. Use a tool to compact the anode into the groove to a depth of cover of 15-20mm. Some of the mortar may have been displaced. If necessary, apply another bead of mortar into the groove. Finish flush with a flexible filler knife. When firm, spray with water within 24 hours to aid curing. After at least 24 hours or when the mortar has set hard, core selected slots to check application. The area is sprayed with water during the cleaning of the slots and the area surrounding the slots has been thoroughly soaked. Allowing fresh concrete or mortar to cure effectively is a very important part of any concreting process. The main purpose of curing is to prevent the premature drying out of the mortar that might otherwise lead to shrinkage or cracking. There are many accepted methods of curing concrete and it is especially important to provide the necessary protection when large areas of concrete are exposed, such as on a bridge deck or airfield pavement. In this particular instance, the mortar is confined in a slot where 90% of it is surrounded by damp dense concrete. 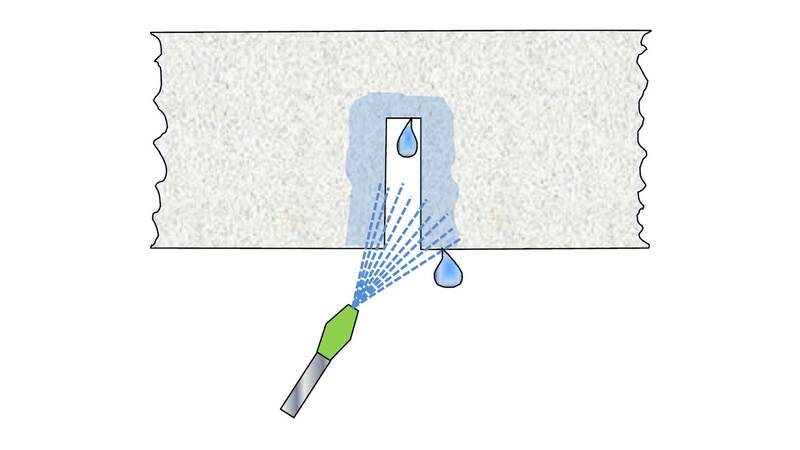 The only way moisture can escape is through the narrow gap at the bottom and because that gap has been sealed by the plug of mortar compacted into place by the finishing action with the filler blade, there is a very limited escape route for the water vapour. The location of the site over water will provide a suitably humid environment and the area is sheltered from drying winds. It would be impractical to suggest using polythene sheeting and most spray-applied curing membranes that are safe for use in marine situations have poor curing efficiency. We have advised that the best way of providing effective aid to curing is to spray the filled channels with clean water as soon as the mortar has stiffened sufficiently to resist washout and certainly within 24 hours. The actual timing of the spraying will depend on the ambient temperature which is being constantly monitored by the contractor.